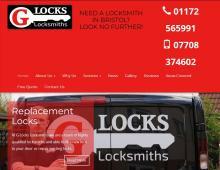 G Locks Locksmiths are a well-established locksmith in Bristol, they specialise in both domestic and commercial lock repairs in Kingswood and the surrounding areas. G Locks Locksmiths provide a wide range of locksmith services including UPVC door lock repairs in Pucklechurch, lock replacement in Long Ashton, commercial lock repairs in Kingswood and the full range of locksmith services in Bristol. Do you need a 24 hour locksmith in Emersons Green, Kingswood, Bristol and Bath? G Lock Locksmiths have superb non-destructive entry skills and are available to help you with their emergency locksmith in Warmly, Kingswood, Bristol and throughout Avon 24/7. G Locks also provide mobile key cutting services in Clifton, Kingswood, Bristol and Bath. If you want new keys cut, G Locks Locksmiths will visit your home or business and have your new keys cut in a matter of minutes. If you are looking for someone to carry out a lock change in Bitton, or a reliable, domestic Bath locksmith or commercial locksmiths in Bristol, contact G Lock Locksmiths for a cost-effective solution.